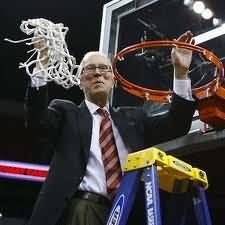 Home › Basketball Plays › "Heat"
This play has been used by coach Steve Fisher at San Diego State University. Start in 4-out with O5 low (diagram A), and it ends up in a 3-out, 2-in set. O1 passes to O2 and O5 moves up to the ballside elbow to set the UCLA screen for O1. O1 uses O5's UCLA screen and cuts inside. After O1 cuts through, O4 moves inside to eventually screen for O5. 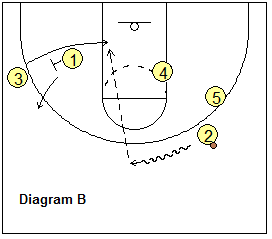 After the UCLA screen for O1, O5 moves out to ball-screen for O2. O2 dribbles to the top (diagram B). O1 back-screens for O3 and O3 cuts under this screen. O3 could be open for a quick pass from O2. After O3 cuts around the screen, O1 cuts out to the arc and receives the pass from O2. There could be a 3-point shot for O1 here. Meanwhile, O3 and O4 set a staggered double-screen inside for O5, and O5 cuts under these screens to the ballside block for the quick pass from O1. After screening, O4 flashes to the ballside elbow and could get the pass here from O1. 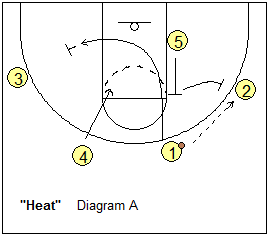 O4 could shoot, shot-fake and dribble-drive the right side of the lane, or make the hi-lo pass inside to O5. 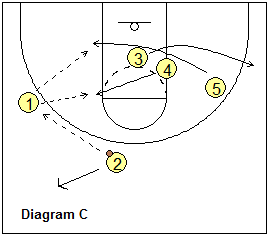 To give O4 some spacing, Coach Fisher likes O2 to space out very high above the arc. After screening for O5, O3 moves out to the weakside wing-corner area.